All of our classic cars are given a full inspection before sale from our independent mechanic who has more than 20 years experience working with many different types of vehicles. Any further inspection is of course welcomed and encouraged. Let us know when you would like to visit and we will make the vehicle available for viewing. ​We look forward to meeting you soon. This late August 1979 registered is one of the last British made MGs. It has only had 2 previous owners from new and shows 88k which we believe to be correct (although we can not warrant the miles). This car has been extensively restored in its life by the second owner including inner wings, floors, hangers, wings, lower rear wings, sills, inner boot area etc etc. The interior has been refreshed with updated and recovered seats and the carpets and door cards present well. The dash is all complete and everything is working. This Roadster comes with a full black tonneau cover fitted, It does have a roof and frame for the roof but the roof needs repair as does the mountings for the frame. It is not perfect but then it is not a 6k car either, Although solid, the rear lower wings have had some repair and repainted in a slightly different shade of red and there is some bubbling present., However you can feel in behind this area and it is not rotten so we suspect it is down to poor paint preparation. Overall the paint finish shines up well but there is some imperfections so in time it could be resprayed if required. There is sadly no history with the car but it does come with the logbook, mot and a gold car check certificate. There are less than 40 of these from this year in this spec on the road and less than 200 left on the road..
With a little bit more detailing work could be a concourse entry - definitely an ordinary car from the 90s that due to its rarity and condition is now head turner and a great little car. This little gem of a car has only one previous owner from new until 1983 when it was purchased by the previous owner. He used the car everyday for 25 years and when he retired in 2010 he built a garage so he could restore his Morris. He spent two years and many thousands of hours and pounds buying everything new. The car was taken apart and put on a spinning jig so he could strip and reseal the underneath once all the panels had been repaired. The engine was stripped along with every other part. We have over 60 photos of every stage of this work being done. The car was repainted in its original black colour to a very high standard and it has never been driven in the rain since. The underside of this car is as good as the top. The engine bay is like new. It drives very well. We have not covered much mileage in her since we trade in classic cars and want to maintain the low mileage as much as possible. You do need to be careful with the gear changes and the brakes are not like a modern car - this is how a Morris would have been in 1961. 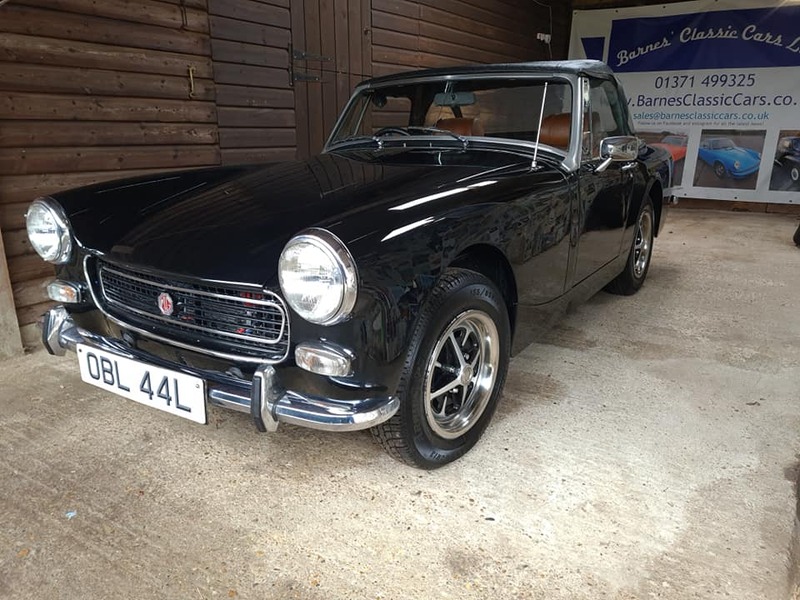 With only two owners in her life this car has been loved and cherished and is needing a good home - certainly with some interior scrubbing (which is already very good with no rips or tears) it is going to steal any classic car show. 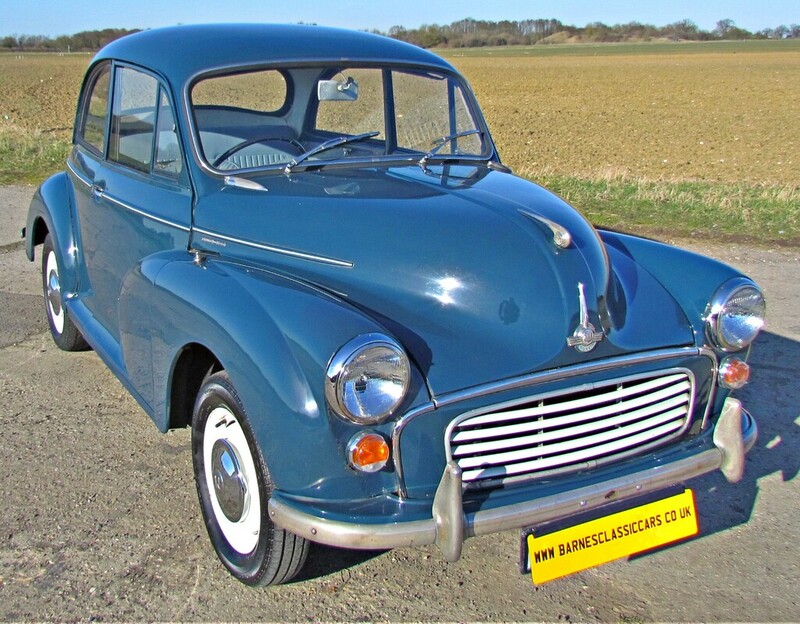 It has a clear MOT until Sept 2019 for peace of mind and if you check online you will see it has been MOT'd every year since 2010 with no issues. Her speedometer was reset in 2012 when the rebuild was completed. We have a comprehensive file of invoices and without a doubt this is one of the finest of these appreciating classics available. 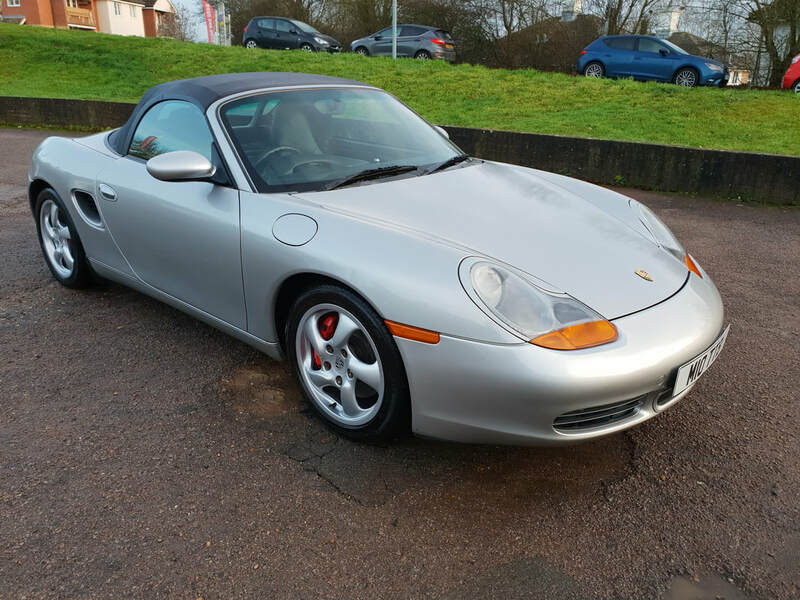 Our personal car for the last year, this is a well tested and reliable 2002 986 Porsche Boxster S. We have covered over 10k in this car and never had a problem. First registered in March 2002 it is the last run of the first series (pre face lift) and in totally standard finish and in excellent condition. If one of these was ever to become collectible this is the purest vision of the Boxster S that Porsche intended and so the one to have. We have taken this car to some shows over the summer and had many admiring glances. This modern classic also drives really well and has air conditioning and a great stereo (although the flat 6 soundtrack is the best one....) so can be driven on long on short or journeys with no issues at all. We would comfortably cross Europe tomorrow in this car. The Boxster S is the 3,2 version of this iconic car (and much quicker and more exclusive than the 2.5 or 2.7) that gives all the thrills of its bigger 911 brother for a fraction of the price. The 6 speed manual box is precise and the car has amazing stats - 0 - 60 in 5.6 seconds and onto a top speed of 162 mph. Rated at 250 hp this car is not only quick but good on fuel - the average return is around 27 mpg so it is a reasonable prospect for everyday driving - especially with classic car insurance available. A 40 yr old with a clean licence can expect to pay around £250 a year for fully comprehensive cover. Please note the private plate will be removed before sale. More pics to follow - call us to book a viewing at your leisure. We are open to p/x for other classics and modern classics. Welcome to the sale of our Porsche 911S. Dating from 1974 this is the first year of the impact bumper and a true 'G' series car. Made for the UK market so original RHD with the 2.7 derestrcited Euro Spec engine running the Bosch CIS system. The 911 S rates at around 170 bhp which for a little car like this is plenty. This car is in excellent order and presents as original. It is an 'unmessed with' example that even has the original stereo and single speaker. It is finished in Mexico Blue and although it has been repainted back in the early 90's it is the original colour code. There is much to say about this car that has a history file back to the first owner with copies of the logbooks to prove. It has been cared for and had the tensioner upgrades and an engine rebuild in the last 20k. t has been sold by Bonhams in its time (we have the catalogue) and was with the last owners for some 20 years. It has a 5 speed gearbox, electric windows and recent new brakes calipers and pads. The tyres are also very recent all around. 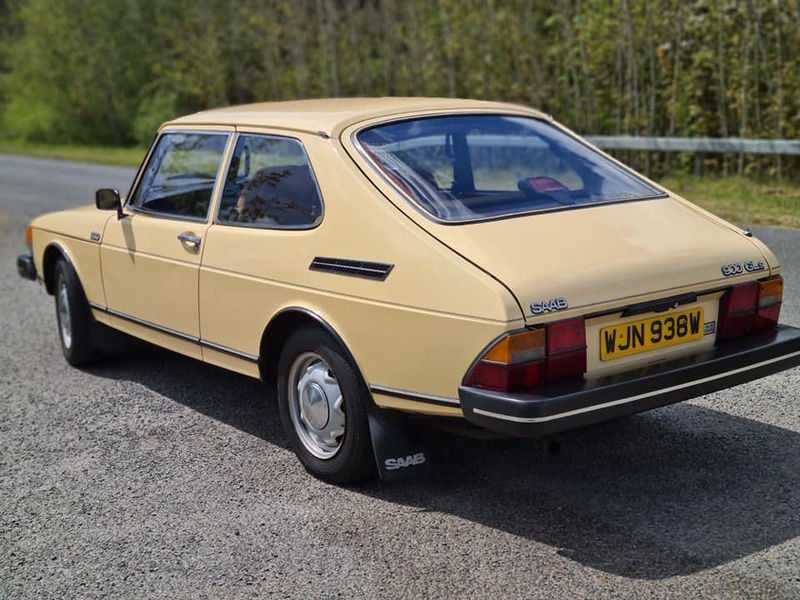 It presents well and there were less than 1600 of the S model sold in 1974 so this, in this colour, is very rare indeed. We are not highly motivated to sell as these are a great investment but everything has a price. Offers in the region of £35000would secure. We want you to be delighted with your classic car - we search far and wide to bring you honest examples of cars and we will always point out any issues to viewers. All of our vehicles have a comprehensive mechanical and bodywork check provided by us before sale. We also provide a full gold report through Total Car Check. A certificate is issued with each car upon purchase and is available for inspection to ensure your peace of mind.